Lilac is a genus of flowering shrubs consisting of 25 species native to Asia and Europe. They can grow up to 30 feet in height, though most only reach about 10 feet. They produce large clusters made up of numerous, tiny flowers between 5 and 10 millimeters in diameter. The flowers typically produce a strong fragrance, and are purple, yellow or pink in color. 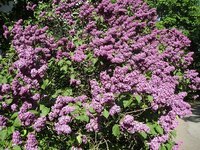 Lilac bushes are easy to care for and require only occasional maintenance once established. Plant lilac bushes in full sun during the spring. Ensure the location receives good air circulation and is not blocked from the wind, or fungal infestations can occur. Combine dolomitic limestone with the soil prior to planting to raise the pH level. Refer to the manufacturer's instructions for proper dosage. Water lilac bushes for four to five minutes three times a week during the first week. Reduce watering to twice a week during the second week and once a week from the third week until the plant is well established. Water moderately once per week after the plant is established, and only on weeks that receive no rainfall. Spread 2 inches of mulch over the ground around lilac bushes. This will insulate the soil, conserve moisture and provide extra nutrients for the plant. Refresh the layer of mulch when it becomes visibly deteriorated. Shredded cedar mulch is recommended, as it is also a mild pest repellent. Feed lilac bushes once per year beginning in spring of the second year of growth. Use ½ cup of slow release fertilizer for every 10 square feet of soil around the lilac bush. Do not allow the fertilizer to touch the base of the plant, or the nitrogen will cause burns. Prune back overgrown lilac bushes in late winter just before new growth begins in spring. Use pruning shears to cut the plant back as far as desired, but extensive pruning may result in no blooms the following season. For the best results, prune only unruly or damaged branches. Dolomitic limestone can be purchased at well-stocked lawn and garden retail stores. Select a disease-resistant cultivar of lilac to avoid dealing with powdery mildew and other ailments. How Does a Barberry Bush Grow?